Everyone has orphan skeins. Leftover yarn too pretty or interesting or costly to give away. I keep mine in a nice basket, though it's usually overflowing. Sometimes, I wonder why I can't let them go find new homes where they won't be ignored. Sometimes, I feel a little guilty about the clutter of miscellaneous balls of yarn. Now, I've shed my guilt, and I have a new purpose in my knitting life, thanks to one adorable book, "One Skein Wonders - 101 Yarn Shop Favorites." You, too, can let go of your orphan yarn and make socks, hats, scarves, baby sweaters, belts, jewelry, arm warmers, purses, and much more. Oh, did I say buy new yarn? It's just one skein... Maybe some cashmere. Or is that fun novelty yarn calling your name? Browse the 101 patterns by yarn weight or by photo. The table of contents is sorted by yarn weight and color photos are together in the middle of the book. Each photo lists the page number of the pattern. The patterns have small photos of the item for reference. The book is very easy to use and fun to leaf through. See a sampling of free patterns from the book's website. Yarn shops across the US contributed the patterns, which shows in the diversity of styles, yarns, and skill levels. If you enjoy yarn shops like I do, you'll appreciate the listing and descriptions of all yarn shop contributors. Maybe I can visit one or two on my travels here and there. Must keep this list handy! If you need to brush up on a technique or two, a handy glossary with diagrams is included. Overall, a lively and fun knitting book with a diversity of patterns in yarn type, skill level, and complexity. Enjoy! Enjoy creating special keepsake greeting cards for all types of occasions? Learn to use family photos, from current to vintage, and your paper-crafting tools in Simply Sensational Scrapbook Cards. The card projects are for those of us who like to play with papers, punches, ribbons, glues and embellishments. They celebrate the recipient in such a thoughtful way that they're sure to be treasured. If you are a beginner, the first sections are a great introduction to cardmaking, and if you are an experienced scrapbooker or cardmaker, you'll probably pick up a technique or two. The card projects are also full of neat techniques and designs. Unlike some cardmaking books, the author discusses her design decisions. She doesn't assume that you will blindly follow her design, and instead encourages you to use your own materials. There are 10 various card projects included and a few envelopes and a presentation box. The cards range from simple folds to elaborate multi-panel cards and miniature albums. The instructions are step-by-step with lots of photos and extra tips. For many of the designs, the author shows how it can be adapted to other occasions. An extra section at the end shows ideas to adapt the card projects to scrapbook pages. There's a lot of ideas and techniques packed into 10+ card-making projects, and any cardmaker will enjoy this book. If you are a fan of antique quilts, country quilts, or Thimbleberries quilts, this book is for you, unless you already own the first five Thimbleberries block of the month series. For everyone else, this beautiful book is a superb collection of five quilts, containing 60 different blocks. And it is a beautiful book. I have many quilt books - I wish they were all designed so well. The quilts, blocks, and instructions are laid out with clarity and simplicity. images, both photos and diagrams, are large and uncluttered. Each quilt is shown in a lovely country setting with an interesting description of the quilt and the blocks. Many quilt books stop there, but this book also includes a photograph of the entire quilt and a large photo of each quilt block. The fabric list also shows a photo of each suggested fabric. I love the photos. The directions for each block are illustrated with handy diagrams that show block construction. The quilts were designed to be non-intimidating, completed a block per month. And the quilt blocks get more complex further into the book. They serve as a fine quilting course, with a little help from a how to quilt book. There are quilt directions included, but a complete beginner may need more help. The first quilt is called "Month by Month." Each block represents a different month of the year. I think a pillow made from the block for their birth month would be a thoughtful gift for just about anyone. The blocks would also be nice as slipcovers for living room throw pillows to change out each month or season. Me, I like villages. I collect them, and fill my knick-knack shelves with little houses. The second quilt, "Thimbleberries Village," is perfect for me. With blocks like "Main Street Manor," and "Log Cabin Lane," that I can cap off with "Sunlight" and "Apple Orchard," how can I resist? I have several friends and relatives who feed the birds (and squirrels) year-round. The third quilt, "Safe Haven," is full of birdhouses in a vertical style. Next, you can stitch pieced blocks of tulips, bleeding heart, lilies, and daisies in the fourth quilt, "A Quilter's Garden." It's remarkable how these five quilts are so alike in style but differ in execution and design. The garden quilt is set on point, the birdhouse quilt blocks are vertical blocks, while the village quilt has an asymmetrical layout. "Pansy Park," the fifth quilt, has blocks on point in a dramatic setting. The description calls it an important quilt and an heirloom quilt. The formal layout and lavish borders suit it very well. For traditional-style quilters, this book deserves a place in your library. I enjoyed it thoroughly - great quilts presented very well. Growing up, I never wore a store-bought costume. Nor did I wear an elaborately-sewn homemade costume. My strongest Halloween memories are my mom brainstorming a creative costume out of next to nothing. Rarely did my sister and go out trick or treating as the latest trendy character. We were more likely to show up as a television set. My mom's inguenity and creativity had a big impact on who I am. I still love Halloween, and I was tickled by this Halloween Costumes ebook that I found recently. I've seen many Halloween costumes books. Most have color photos and are sold in the big bookstores. This book is a homemade family affair, like I remember Halloween with my family. It is in pdf format to read or print from your computer. You can download it today. I print the pages that I'll need when I need them. There aren't many color photos with the costumes, though some have simple diagrams. Some have links to websites to show you the idea. Since you'll be making most of the costumes from items you already have or can easily get, your costume will have its own unique flair. Reading these pages of costumes, I felt like I was listening to my mom and her sisters figure out my costume this year. There are more than 90 different costumes listed in alphabetical order with a table of contents. They range from people to characters to objects, to plays on words and animals and occupations and more. Just read the table of contents to your kids and you'll be on your way to a happy Halloween. The costumes are very child-friendly and safe. Many are based on a sweatshirt and pants or leggings. They use simple supplies like posterboard, cardboard boxes, and basic craft supplies like paint, pom-poms, and pipe cleaners. One high-tech innovation that I like is how they suggest taking a playing card to the copy center and having it blown up to blueprint size to make a Queen of Hearts costume. This technique is used in a few ideas and costs just a few dollars. If that's not available to you, they do suggest alternatives. There are a few extra ideas in this book for last minute costumes, sibling costumes, face painting, papier-mache masks and Halloween treats. Plus, this e-book comes with two extra books. One is on face painting. 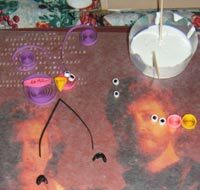 It includes a few popular designs with step-by-step photos and instructions. The second bonus is Halloween Food for Kids, with recipes and party foods. If you're looking for a great resource for making easy homemade costumes for your kids, you'll enjoy this book. The Halloween memories from making your own costumes are priceless, and this book makes it easy. Happy Halloween! They've also just released an entire book on face painting. An easy and relaxing craft that creates attractive, durable items. Recently, while sitting in a waiting room cross-stitching, I noticed another woman doing a craft that I had not seen before. She was using an odd type of crochet hook, pulling loops of fabric through a rug hooking canvas. Locker hooking, she explained, and pointed me to the website of MCG Textiles, where she bought her hook and books. Locker hooking is a simple craft that creates durable, attractive items, from rugs to purses and more. The two essentials are a locker hooking tool and rug hooking canvas. The other items can vary. A locker hooking tool has a crochet hook on one end and a large needle eye on the other. The crochet end is used to pull loops of your material through the holes in the canvas mesh. After you've pulled up a few loops onto the hook, then the needle eye, threaded with yarn or cord, is pulled through the loops, locking them in place. I'm working on two locker hooking projects right now. The first is a hot pad, using fabric strips. It is the beginner project from this book by MCG Textiles. To create the fabric strips, I notched a yard of fabric every inch and tore several strips at once. To lock the loops, I'm using the cord from MCG Textiles. It is precut into handy one yard lengths. The edges of my rug canvas were turned under a few rows, and whip-stitched with a fabric strip, using the needle eye of the tool, to create a finished edge. The first row of locker hooking is the trickiest on this project. The first square in the lower right corner has 3 layers of canvas, because of the edge, and is partially filled with the whip stitching. The next rows were easier, and I became more comfortable with the up and down motion. I've heard reports that fabric locker-hooked rugs still look beautiful after years of use and machine-washing. Looking at my little hot pad, I can believe it. It is very sturdy, and has a nice country style to it. My second project in progress is a purse from this book by MCG Textiles and Lion Brand Yarns. This time, I'm using Lion Brand Homespun yarn as both the loops and locker yarn. I'm making the purse pictured on the front cover. The yarn locker hooking is a little easier than fabric, since the yarn is thinner than the fabric strips. It's creating a great nubbly texture, that also looks to be very sturdy. This is one yarn purse that will not stretch out or sag. The two pieces of the purse are made separately, then stitched together to form a simple purse. In the pattern, they embellish the top edges with an eyelash-style yarn, but I may use a ribbon yarn or continue with the Homespun yarn. We'll see when I get there. I've also read about Australian locker hookers using rovings from their herds of sheep for the loops. I think this is wool fiber that's been washed, but not spun into yarn. Sounds interesting. Rovings are available in colors or natural from sheep farms online. Locker hooking is an easy, relaxing craft. 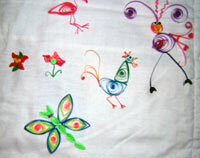 Patterns are drawn on the canvas, so no counting of rows or stitches. Depending on the size of your project, it's easy to take along, and easy to put down when the need arises. I find myself picking it up in the evenings to relax. MCG Textiles has photos and instructions, plus all the supplies and books on their website. Create Your Own Online Diary or Journal. letting you add chapters, see the whole picture, and easily find whatever you're looking for. OurStory can also be used as an online journal, diary, blog or scrapbook. Humble crochet is due for a resurgence. I know, I've said it before, but this book of modern crochet certainly shows it. The patterns in this book are fresh and different. If you're an experienced crocheting, you will be happy buying this book for the shapely sweaters, cool hats, unique baby items, and other interesting patterns. If you haven't crocheted, or have just crocheted a little, this book is a comprehensive primer on exactly how to do it, how it differs from knitting, and what you need to get started. Not much is necessary, and there's a great explanation of different yarns and hooks. Though I grew up with crochet, I enjoyed reading about the history of crochet and what types of item crochet makes best - lacy items and sturdy items, but not stretchy ones. Crochet, through the years, has been taught from person to person. It's probably easiest to learn from someone else. But, if you can learn from a book, this book may be the one. The instructions are conversational and full of little tips. Different methods of holding the yarn and creating the basic stitches are also explained. The instructions chapters start with a chain stitch, move into single crochet, then into types of double and triple crochet. Adding yarn, increasing and decreasing are also demonstrated. Fancy stitches like shell, popcorn, ribbing, spike stitch, and even granny squares are explained. Tapestry and filet crochet are shown, along with the afghan stitch. The instructions finish with all the info you need to finish a project - joining pieces, seaming, buttonholes, blocking, and more. It is very comprehensive! Let's talk patterns. The designs are from a variety of the new breed of pattern designers, and they vary a bit in their styles. There are more than 40 patterns, sorted by category. Each pattern lists the weight of the yarn used, which is nice to see. The scarves and shawls patterns are nice, and the hats are cool enough for teenagers and boys. The bags and totes are unique and mostly retro-modern. I really liked the clothing in the Spring & Summer and Fall & Winter sections. The summer tops, halters, tanks and t-shirts, are very cute, and similar to what I've seen in stores. The often-requested crochet bikini is vintage style, and includes a carrying bag. The Fall and Winter sweaters are not boxy, and do not look homemade. Your favorite guy might even wear the jolly roger sweater. The "Unseamly Sweater" is shaped through changing stitch patterns. The only seams are at the underarms and armholes. Patterns for accessories include a wide corset belt, fluffy bunny slippers, wire jewelry and more. Home, gifts and baby items are rather miscellaneous. The sock monkey baby set is a nice change from traditional baby layettes, while still being very cute. Crocheters of all levels can find something to enjoy in this book. The instructions and reference are valuable to have on your shelf, and there are probably a few patterns for everyone. I even enjoyed reading it. Fiskars, well-known for their scissors and paper punches, makes a great system for embossing, stenciling and cutting. It's super for scrapbooking and cardmaking. Everything in these sets works together. I have several of the sets, and thought you might be interested in this versatile system. The first piece that you need is the Scrapboss. Measuring 12 inches by 12 inches, it's big enough for full-size scrapbook pages. Templates are fastened to it by repositionable pegs. Underneath, there's a storage tray to store templates and paper. It comes with 2 styluses, some stencils, and a project book. The Scrapboss can use any stencils and templates that Fiskars makes. There's a smaller cousin, the Shapeboss. > It fits stencils and templates that are 9 inches by 11 inches and smaller. It comes with a stylus and some stencils. It does not have the storage tray. For the smallest sizes, try the Cardboss > or Mini ShapeBoss Set > The stencils listed on those pages both work on the Scrapboss and Shapeboss. 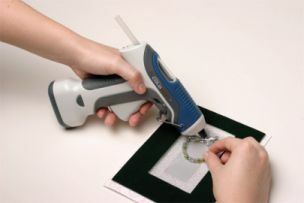 Embossing and stenciling are very easy with this system. The laser-cut stencils come in two parts. First you lay the bottom piece on the Scrapboss, then the top piece. The top piece has grid lines and is marked, "top." Next I usually put a couple pegs in the corners to hold it securely in place. I position the paper, cardstock, or thin metal in between the two pieces and, start embossing. The styluses comes with different size tips. Smaller tips are better for detailed areas, while large areas can be finished quickly with the bigger tips. The stencils come in a large variety, from abstract lines and letters, good for lots of pages, to holiday and baby themes. If you click on the small pictures on this page and this page, you can see the details of each one. Sometimes I emboss right on a 12x12" scrapbook page and create borders and frames. I also make embellishments by embossing smaller pieces or copper pieces. I usually emboss before cutting them out. It's easier. Another set that I use alot to make photo mats and embellishments for scrapbooking and cards are the Texture Plates >. They're made of hard plastic with holes at the top for the pegs. Each is two-sided, with a different texture on each side. The assortment pack is a great value and contains 6 double sided plates (12 designs) including hearts/ stars, lines/waves, bubbles/dots, squares/fabric, stones/bricks and wood/leaves. I use the Texture Plates with the Shape Templates that I'll talk about later to create my own textured die-cuts. For example, I put the heart shape template on the Scrapboss with a hearts texture plate beneath it. I slide my paper in-between. I emboss inside the heart shape, creating a hearts texture. Then I cut out the heart shape. It's very cute! I also like to create titles this way, using the letter and number shape templates and the other texture plates. The Fiskars templates for cutting are designed for the ShapeCutter >. It's a very safe and accurate way to cut out clean shapes and letters. The cutting mat and shape templates fit the Scrapboss or Shapeboss and have holes to secure them with the pegs. Using the ShapeCutter is very simple. Hold the base of the ShapeCutter inside the template and follow around the edge. To cut a freehand design, I just look down at the blade and follow my traced line. The blade is adjusted by a knob on top for different paper thicknesses. The ShapeTemplates are sturdy plastic with grid lines, and can be stored in a binder. They have several shapes on each one, and some have border designs along the sides. They come in many varieties > and letters and numbers. > There's also a set of Super Size ShapeTemplates >. On these, you can use the inside and outside of each shape, That's great for cropping a photo and creating a matching shape mat. Overall, I use the Scrapboss alot in my paper-crafting. It's very versatile, and I can create many different looks, cards, and layouts. This could be a very short review because I can sum it up in one sentence - if you buy only one scrapbooking book in your lifetime, buy this book. However, I suppose I must explain myself. While many crafts books claim to be encyclopedias, few are comprehensive enough to deserve the title. With more than 300 pages, the "Enclycopedia of Scrapbooking" covers all of scrapbooking. Not just definitions and pictures, most entries explain how to use the tool, idea or embellishment. I've found several techniques that I can't wait to try on my pages. Since this book is by Creating Keepsakes magazine, every other page or so contains great layouts using the techniques illustrated. ver been intimidated by the selection of scrapbooking items and doodads in the craft store? The next 3 chapters are for you, and me, too. Beginning, Intermediate and Advanced Embellishments covers every technique and material that I've seen used in a layout, and more than a few that I have to try. Trust me, it's all there. From brads, chalks, conchos, eyelets, inks, mounts, mica, vellum, to watch crystals and everything in between, the quantity of information is outstanding. Each item explains how to use it, and shows you several layouts using the items. his well-rounded book has a gallery of other uses for our scrapbooking toys, additional resources, and an appendix to cover technical stuff like archival quality, technology and organization. ike scrapbooking? Want to try scrapbooking? Need a motivation to get started on those boxes of photos? The "Encyclopedia of Scrapbooking" belongs on your bookshelf, though I suspect mine will be out and read through again and again for good while. You could win a family Disney vacation for four when you join ClubMom for Free. Great book for intermediate to advanced beaders and adventurous beginners. Dazzling Bead & Wire Crafts is a book full of creative and different bead & wire projects. More than 50 projects cover the range from demure jewelry to purses to home accessories and gifts. Many crafts books begin with a techniques section. There are many technques in this book, but they are part of the projects. Most of the projects contain an unusual idea or application that can be applied to other projects. The introduction is brief. The supplies section discusses and illustrates several non-traditional types of wire - armature wire, solder wire, buss wire, aluminum wire, and more. After a short section on tools, the projects begin. And the projects are exactly why you will like this book. They're fascinating. Let's dive into some of my favorite projects in this book! A delicate pearl and wire choker uses pink colored wire to tremendous effect. A necklace for grandma uses scrapbooking supplies to frame photos of the grandchildren. Small jump rings are added to the frames to string them. Polymer clay is used in several projects. In the Beads & Charms necklace, polymer clay is stamped with words inside bead charms and strung onto a necklace with wire wrapped beads. Polymer clay is used on an elegant headband. The clay is stamped and twisted head pins are inserted into each medallion. Polymer clay is also used in a few designs to create pendants. Another unique element in these jewelry designs is the trendy bottle caps. In the Beaded Palms earrings, the edges of the bottle cap are punched and strung with seed beads. In wirework, a homemade or store-bought jig can be used. Pegs are arranged so that you can bend and wrap the wire into intricate designs. This is used in one example to make a delicate wire twist bracelet. Between the wirework, pastel beads are wrapped in wire and seed beads. It's subtle but stunning. Another necklace design uses the jig to create delicate filigree. Polymer clay and beads are used in a few projects to create unique purses. One is stitched from leather and others are made from various boxes. There are more projects than I've listed, but these are some of the most diverse group of beadwork ideas that I've seen in awhile. With these ideas, you can use your beadwork skills to create gifts beyond necklaces, earrings and bracelets. All of the projects have full page color photos. Many have patterns and diagrams, too. The table of contents and index are useful in finding projects quickly. Overall, this is an excellent book for those who like beads and wirework and are looking to expand their skills and ideas. Well, this is a big book! More than 300 pages of knitting, crochet and embroidery. Truly, it is three books in one. Each section begins with a comprehensive set of instructions for that craft. Large drawings show the stitches and other details. The knitting section covered one of my pet peeves - what if I can't get the yarn they use in the pattern? An article gives tips and ideas to make good substitutions. Each pattern has a color photo and sometimes a few. 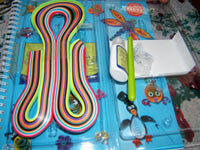 The patterns have summary info at the beginning - skill level, sizes, supplies and tools needed. I have one quibble with the book - the table of contents is very short and doesn't provide a list of the patterns. The patterns are listed in an appendix at the back. The knitting patterns are varied. All the standards are included- afghans, hats, mittens, scarves, shawls, socks, sweaters and vests. Other patterns include a dog sweater and collar, Ipod holder, purses, wire jewelry, and purses. I think crochet has become a hot craft, and the authors seem to agree. The crochet patterns are interesting and modern. Even though the arm warmers done in a fuzzy yarn look like hairy arms. And the Santa's stocking is rainbow-striped and has individual toes... I liked all the rest very much. The baby clothes look cute and probably work up quickly. The patterns also include hats, ponchos, purses, sweaters, tops, a backpack, pillow, shawl, and a jacket to name a few. The beach cover-up was stylish, and the crochet trim for a store-bought top was different. The embroidery instructions are comprehensive. Many types of stitches along with bead embroidery, ribbon embroidery and hardanger are illustrated. Most of the projects are embellishments for pre-made items. They range from elegant to quirky and fun. Embroidered jeans and beaded tops are popular now and both are covered here. Many types of items go under the needle - mittens, napkins, pillows, purses, paper, sweaters, towels, and tote bags. A few of the purses are handmade, with the patterns included. The embroidered greeting card and scrapbook embellishments add dimension to your papercrafts. The Michaels Book of Needlecrafts - Knitting, Crochet & Embroidery is a very solid and worthwhile book for your library. If you're already involved in one of the crafts, it's a great way to learn the others, while getting a good set of patterns. I had a great time testing out this cordless glue gun. It has several handy features and works very well. I was skeptical about the cordless feature, as some in the past have not worked as well as my corded version. Let me explain how the cordless action works on this glue gun. It is very similar to our cordless drill. The battery snaps into the bottom of the handle. To charge, it fits into a small charger which can be kept anywhere near an outlet. The charger flashes a green light while charging and then a steady light once charged. The initial charge took just a couple of hours. The instructions say the battery has no "memory effect" - it can be put back on the charger even if it's not fully discharged. With the battery, the glue gun weighs less than 12 ounces. It feels very comfortable to hold and use. The glue gun has a trigger so glue only comes out when you need it, and a work light at the tip that illuminates exactly where you are working. The light can be switched from high to low intensity. There's a clear window on top so you can easily see when to add another glue stick. This gun takes mini-size low temperature or all-purpose glue sticks. Cold Heat also sells glue sticks just for this gun, that they say will maximize battery life. Right by the opening for the glue sticks, there are two small lights. One is a low battery indicator and the other is the PowerSave indicator. If you do not move the glue gun for eight minutes, it switches to this mode and stops heating the glue. As soon as you move it, it heats up again. The glue heating time was very quick. The gun is well-made and easy to use. It does not drip when resting, which keeps your workspace much cleaner. The FreeStyle Cordless Glue Gun is packed with features and works great. The FreeStyle Cordless Glue Gun is available from Cold Heat. Home Based Candle Business - Easy to Set Up, Full Support & Training, Work your Own Hours - Free Information! Introducing Soy Candle Scentsations; a unique home business opportunity with in-demand products you will be proud to market. Wondering if you could work from home, doing the craft you love? Well, if you have a talent for scrapbooking, you may be in luck. This book is a thorough and encouraging guide to every aspect of starting and succeeding as a Custom Scrapbook Artist (CSA). The 3 main sections of the book are: (1) Starting a CSA business, 2) How to be a CSA, and, 3) Marketing your business. There are many issues to consider when opening a home-based business. From local zoning laws, to registering a business name and a domain name, a business owner needs to make careful decisions. There is excellent info in these chapters to guide you in starting your business right. The checklist at the end of the chapter is handy for any businessperson. Once the basics of a business are covered, the book moves to the details of being a Custom Scrapbook Artist, and really begins to excel. This author is not afraid to tackle difficult issues head-on, and she begins with the thorny topics of copyright and supplies. Avoid the pitfalls when you are reselling scrapbook supplies in albums to your clients by reading this chapter. It's good info. Many business crafts books give little attention to teaching pricing, while it is usually a craftsperson's first and recurring question. The pricing chapter considers the issue from different perspectives, giving you tools to apply to your marketplace. I enjoyed the detailed example of arranging a client consultation - before the meeting, confirming the meeting, what to bring, and more. Being well prepared for working with your client and their photos will help make the entire album go more smoothly. Marketing your business is the largest section of this book. No marketing experience is necessary - it begins with the basics. The next chapters provide enough business promotion ideas to last for years. Many of these techniques are applicable to any business. Here are some of the topics - "Almost" Free Marketing, Direct Mail, Publicity, and Paid Advertising. After you've become a bit established, your business will be ready to try the more advanced techniques. She suggests ways of marketing to niches, and adding items and services. Plenty to keep your business humming along. This book is up-to-date - websites and pay-per-click search engine marketing are discussed. There is an extensive reference section of vendors and groups to contact. A CD containing documents to help you in your business, including a sample contract, is included. The tone of the book is encouraging while presenting a great deal of specific practical information. It covers many issues that I had not considered, including the tricky topics of supplies, pricing, and customer contracts. Many of the ideas and tips are helpful for any home-based business. If you are considering this career choice, I highly recommend this book. You will return to it again and again - as you begin as a CSA, and while running your business. Oh - these are too cute! First, there were fabric boxes and bowls - which I love! Now, try your hand at fabric balls. Let me admit my bias - I like cute, clever projects. Jinny Beyer has done the math and laid it all out in clear steps. Plus, you can use up all those fabric scraps that you just can't throw away! There are more than a dozen projects in this book and they are a good variety on this one theme. Since this book is by Jinny Beyer, the color schemes are inspiring and some of the projects make good use of border prints. What will you do with fabric balls? Use them in home decor, for the children in your life, as cute baby gifts and more. The designs start simple and get sophisticated. The temari style balls would make a lovely gift, too. The opening chapters give a simple but thorough overview of beads, threads, wires, tools you'll need, and the basics of working with beads and wire. True to the title, the strength of this book is her chapters on findings and finishings. These ending details can take your bead work from homemade to wow! Many of these ideas are very innovative. I was even more fascinated by the finishings chapters. They included some great ideas for edges, fringes and original beadwork on findings. The photo gallery will inspire you to branch out from her ideas even more. Highly recommended to take your beadwork to a new level of expertise.